Climbing is never a straight line. Often the top seems close, but we’ll need to change our path and direction constantly listening to the instinct of conservation. After the exploit on Monte Rosa you will be waiting for an even more epic adventure, between animals, ice and the essentiality of distant mountains. Instead today I will briefly tell you about the last workouts, two physical and a mental one. A step forward: training at Monte Rai. Around the Larian triangle, that is the pre-alpine strip cradled by the arms of Lecco and Como, there are various small peaks often used by runners as training for skymarathons and tourists to get comfortable with the mountain. For people like me who live in the province of Milan it often happens to go on a trip on these hills, circumnavigating the Segrino lake, climbing the Cornizzolo, reaching the pyramid of Monte Palanzone and more in general getting lost among these soft peaks. Given the lack of time I couldn’t move beyond the border of the lake and so here came the idea: climbing Corno Birone with two “pelegrinos” friends and the indefatigable Crumb. We leave late, very late, around 10 in the morning. After a bit ‘of traffic we arrive at the parking lot and let go the moorings heading towards Val Molinata, where the Inferno stream dug the famous path of tanks. The two friends attack the river, while I skirt the climb from the east with the fellow quadruped. Rising fast we arrive in a melted state at the plain of San Tomaso, where we rest in an old wash house to escape the sun. Returned to an acceptable temperature we re-energize in the cool forest, finding the two friends, not before having become acquainted with one of the many old locals that continue to sail these paths at the venerable age of seventy (and more). Now the final part begins with a beautiful serpentine in the shade of the trees gradually thinning out towards the top. On the fila stretch we invent a new route by cutting the right path, and still we reach the summit after some skating on the soily ground. Time is always against us, and we have to start hastily to go home, just in time for other commitments. We greet the two friends as we venture along the previously neglected path. Fortunately, Crumb must have swallowed a gps as a pup, so she can find and follow the path even in the highest bushes. For months I had been meditating on finally doing the Alta Via of Grigne, a set of non-trivial paths winding through ridges and limestone walls, passing from the raw rock of the northern Grigna to the wide bucolic valleys of her northern sister. The season is also merciful for now, still offering fresh days thanks to storms consumed on the border with Switzerland. After reaching a saturation point in the deficit of sleep I decide that sleeping 6 hours more or less changed little, so on a regular friday afternoon I run away from work heading to Pian dei Resinelli. Waiting for me there is only the mountain and the special adrenaline that only a solitary adventure can give. From the first stepd I start meeting people descending from the summit, thunderstorms from west seem to point here and despite the forecast predicted everything, except thunderstorms right here, I start to rise with a doubt planted in the head: “will it arrive here or not?”. I watch the clouds swell and bend along the ridges in the distance, they seem far away but only a few miles separates me from those lungs of lightning and rain, and even though the bivouac now seems close I still have a carbon tripod well placed in the backpack, which for this seems to become increasingly heavy. So I decide to stop at about half way, from here I can climb to the bivouac in three quarters of an hour or go down to the nearest shelter in twenty minutes. So I wait to see how the clouds move to understand how to proceed. The first drops come carried by the wind and accompanied by loud thunders in the distance, the cold water awakens me from the torpor of the enthusiasm and extinguishes every trail of hope. Luckily, in the solitude of a mountain depopulated thanks to the thunderstorm threat, a chamois approaches almost by empathy and sits on a spur in front of me. What differentiates us from these animals? And what does it entitle us to present ourselves without invitation in their living rooms? I do not think these trails have been designed for us men, and in looking at myself, wet and cold I find an insurmountable comparison in the relaxed eyes of that chamois calmly lying on a tip that no sane man would have ever reached with the same pace of that animal. The rain thickens, and thunders seem to approach. In less than twenty minutes I am at the Porta refuge with a beer in my hand. The hut-ters, two who will have my age, welcome me and another unlucky one rejected by the rain. Then, in a moment, everything ceases and the sky is free, allowing us to glimpse even the most distant peaks in the horizon. Mock of the mockeries, the weather conditions are now perfect, but the rocks are wet like never before, and now it is an objective risk serious enough to make me completely desist from another attempt to climb. But while I came home I have already identified the date to repeat, or rather, to finally realize this little dream. At 7 am in the car with Andrea, we go to take the famous model and head towards Dervio. Today we’ll close the wanderer’s trail. 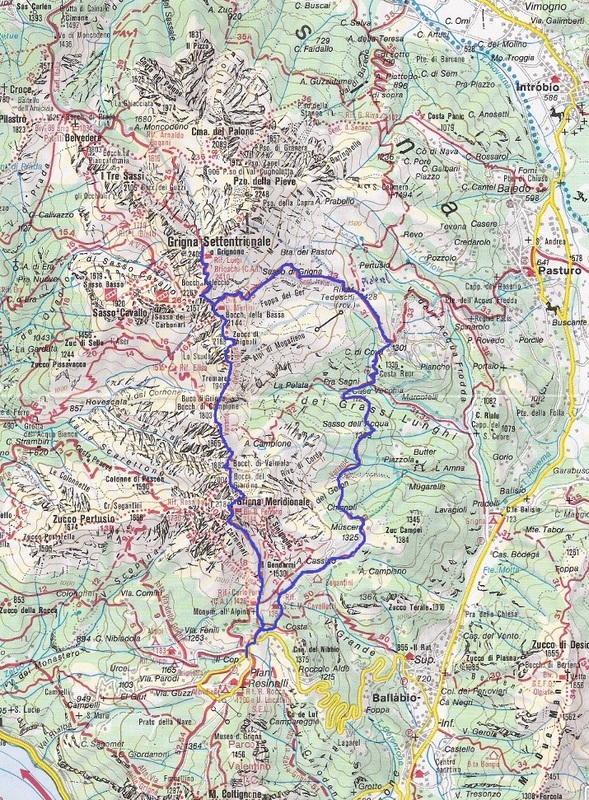 I would like to give you a full piece only on this trail, connecting Abbadia Lariana to Colico (and also to some towns in the Valtellina), so I will spare you the most complete description for now. But I share with you a quick thought: what is a path for a wanderer? and how can a path, which for the traveler is a definition of being, end? If it were to end then the wanderer would come out of it as a “no-more-wander”, and therefore what would remain of the man who has entered initially? Surely one can’t come out the same as the one who initially entered, but the definition of a traveler does not end with the path. In my opinion, a path for a wanderer can only lead to the next one. In the end, the old path illuminates the next steps with the light of the discovery of the self that we found on the road abandoning the old clothes that used to define us. We sweat and move away from the projection of our shadow landing to the ground, abandon the superfluous and the noise of civilization to find in us the communion with a truth that is expressed in the silence of a stream flowing even at night. We emerge from the forest by revisiting civilization and here we are, back to ourselves, ready to take the next path. That this Friday I finally did the Alta via together with two friends! That the sleep deficit is really critical, so for today you will have to settle for these lines.